Tomatoes are one of the most popular garden vegetables, but they are also one of the most finicky to grow. Any number of pathogens, insect infestations and other challenges can crop up and thwart the high hopes and best efforts of even the most experienced gardener. If a tomato plant appears to be suffering, the first thing to consider is whether its basic needs are being met. 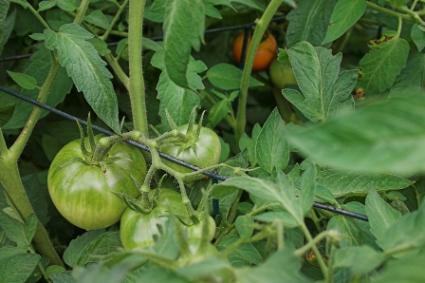 Tomato plants will not thrive and produce good quality fruit if they are in too much shade or if the soil is bone dry, poorly drained or of low fertility. Other than supplying water and fertilizer, there is little that can be done about these problems once tomatoes are planted, but it does allow you to rule out other problems as the primary culprit. Inadequate nitrogen manifests in yellowing leaf tips of the young leaves of tomato plants. This is in contrast to the many diseases mentioned below that tend to affect the oldest, lower leaves first where the discoloration is throughout the leaves rather than just on the tips. Phosphorus deficiency appears as a purplish cast over the leaves, especially of the leaf veins. Both of these are common early in the season when the soil is not sufficiently warm which renders these nutrients unavailable to the tomato plants. This can be remedied with fertilizer. You can also use black plastic mulch to warm the ground and make the nutrients biologically available to the plants. Insects can defoliate tomato plants and cause damage to the fruits and stems. These are a concern with newly planted seedlings. In the night, they will cut the stem of the seedlings just above soil level and then devour the tender leaves. In the morning all that's visible is a short stub of the stem. The worms can be found by raking through the soil or debris in the vicinity of the destroyed plants as they hide out during the day. Collect the worms and kill them with boiling water or by manually crushing them. You can also protect seedlings from cutworms with a six-inch cardboard collar, placed half below the soil line. These are green caterpillars that are no more than an inch in length. They chomp through the leaves when they are young and then burrow into the unripe fruit later on. Tiny balls of excrement will be found in the areas of damage. Treatment involves manually picking off the worms (be sure to check on the undersides of damaged leaves) and setting pheromone traps to catch the adult moths as they lay their eggs on tomato leaves. These are microscopic insects that burrow into the leaves and leave circuitous tracks of dead tissue in the leaf surface, slowly weakening the plant. There may also be a stippled texture on some of the leaves where the adults have laid their eggs. The only way to treat for leafminers is by trapping them in their adult stage when they are small flies. Yellow cards with a sticky substance are used to attract and trap them around the plants. The list of fungal and bacterial pathogens that affect tomatoes is long and full of organisms that are difficult or impossible to treat with harsh chemicals, much less natural methods. It's more a question of managing the severity of the pathogens than trying to eradicate them completely. If there are no signs of insect damage, but leaves are turning brown and yellow or the fruits are rotting prematurely, one or more of dozens of common fungal, viral or bacterial pathogens of tomatoes is likely - fusarium wilt, verticillium wilt, early blight, late blight, blossom end rot, alternaria canker and many others. By using the following practices, pathogen damage can be minimized, allowing the plants to ripen their fruit. Water at ground level only - most of these organisms proliferate in moist conditions, so it's best to keep the foliage and fruits dry. Mulch around the base of the plants to prevent rain and irrigation water from splashing off the ground and transmitting soil-borne pathogens to the plant. Remove and discarded infected foliage as soon as it is detected. Maintain the best possible air circulation around your plants by thinning out excessive vegetative growth and spacing the plants widely. Rotate tomato plantings to a different section of the garden each year. Discard infected plants at the end of the season, along with the mulch that was used around them. In heavily-infested beds where it becomes impossible to grow tomatoes, try covering the soil with black plastic over the summer - the heat will cause the pathogen populations to diminish. Genetics play a big role in resistance to disease. Seed catalogs are full of disease-resistant varieties to try, but always look for those labeled with the letters V, F, T, N, or A after the variety name. These are abbreviations for the most common tomato diseases for which horticulturalists have bred resistance. VFTNA tomatoes are the most disease-resistant of all. Your regional university or county extension service is a good source of information about the tomato pests and diseases that are most rampant in your area. It's important to become familiar with local knowledge of problems with growing tomatoes and they typically provide information and diagnostic services free of charge.